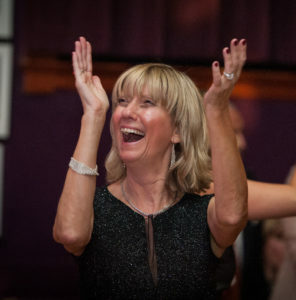 Thank you to all hosts/hostesses and all guests who made Saturday’s celebration such an amazing success. Photos will be posted here soon. Thank you also to Sally Mayer, Kate Brashears and Donnelee Genaro for their tireless hard work to make the day and evening events so spectacular. Ivoryton: The Ivoryton Playhouse is celebrating 25 years of laughter and drama, new shingles and seats, and more and more music and romance and applause than ever before. 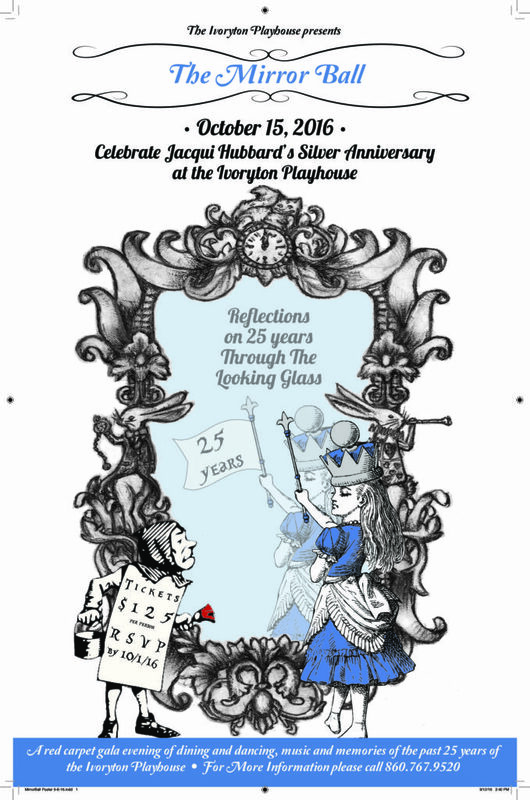 This year marks the 25th year of Artistic Director, Jacqui Hubbard’s involvement with The Ivoryton Playhouse. Beginning as a Board member in 1991, she became Board President and in 1999 she was hired as Artistic/Executive Director and oversees all aspects of this small, historic gem of a theatre. 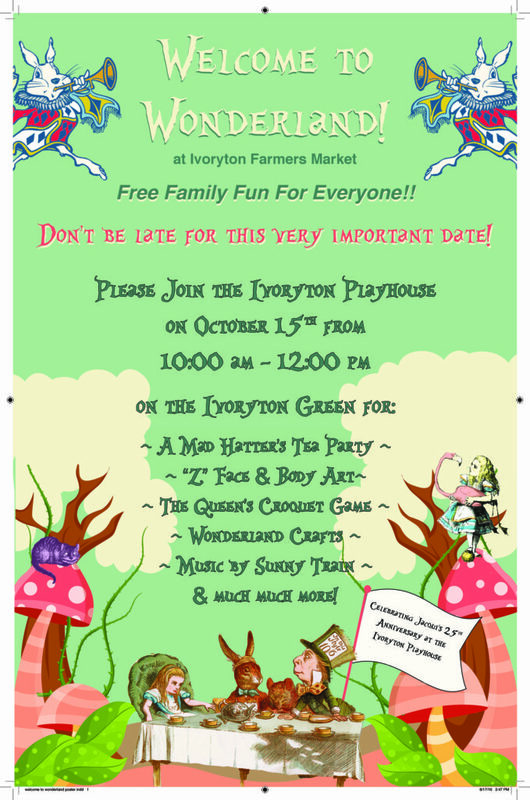 On October 15th, the theatre will celebrate with a Wonderland Tea Party from 10-noon at the Ivoryton Farmer’s Market. Free activities for children will include A Pink Flamingo Croquet Game, Madhatters Tea Party, Queen of Hearts Story Time, glitter tattoos and face painting and musical fun with Sunny Train. In the evening, the theatre will host a red carpet gala. The Mirror Ball: Reflections on 25 years through the Looking Glass will feature cocktails and fine foods catered by Coffee’s Market; a musical retrospective of the past 25 years with performances by some of our favorite artists; champagne toasts and dancing till midnight to the fabulous music of Long Island Sound. Built in 1911 as a recreation hall for the workers of the Comstock-Cheney factory, the Ivoryton Playhouse has been an important part of Connecticut’s cultural landscape for every one of its 100 years. Traveling vaudeville shows and silent movies entertained residents of the shoreline area in its early years until Milton Stiefel turned into a summer theatre in 1930 and attracted stars like Katharine Hepburn, Norma Terris, Marlon Brando and Tallulah Bankhead. In recent years the theater has continued to win critical praise: Connecticut Critic Circle Awards, a Shoreline Arts Alliance Bravo award for Best Theatre and the Shoreline Times Readers Poll Best Theatre award as well as Connecticut Magazine’s Best Place to see Live Theatre. Tickets for the Mirror Ball are $125 each. For more information, to purchase tickets to the Mirror Ball, the 2017 season, and all things Ivoryton Playhouse, please call 860.767.9520 or visit our website at www.ivorytonplayhouse.org. Our thanks to Outthink for producing another great video clip for us! Actress Talia Thiesfield explains that the importance of Aldonza from Man of La Mancha is on a par with the roles of Fantine from Les Misérables and Evita’s Evita Perón. One of the world’s most popular musicals and winner of five Tony Awards, Man of La Mancha, the “Impossible Dream” is based on Cervantes’ masterpiece Don Quixote, which itself is considered by many to be one of the greatest literary works of fiction ever published. The musical is a play within a play that follows the story of aging nobleman Alonso Quijana who, as Talia says, “to the public looks like he is losing his mind, but who really may be the sanest of us all.” Backed by his trusty squire Pancho Sanchez, Alonso renames himself Don Quixote and goes off in pursuit of the perfect dream. His adventures and misadventures include dueling windmills and defending his perfect lady. A poignant musical, Man of La Mancha is moving, thought provoking and highly entertaining. It will warm the heart of everyone who has ever been inspired by the prospect of victory by the underdog against all the odds. Talia Thiesfield is back home in Connecticut! This time to perform the role of Aldonza –Quixote’s love object Dulcinea- in the popular musical Man of La Mancha opening September 7 at Ivoryton Playhouse. Based on Cervantes’ 17th century fictional masterpiece Don Quixote, the play follows Quixote and Sancho during their adventures. Talia Thiesfield is not the only one connected to Connecticut when it comes to this particular show. It was first commissioned and produced by Goodspeed Musicals. In 1965 Goodspeed commissioned inspired by the TV adaptation of Don Quixote, to create what is now the 5 Tony award-winning show Man of La Mancha. And the rest is history. The show made popular the song ” The Impossible Dream.” Aside from Thiesfield, the cast includes David Pittsinger, as Don Quixote, and Brian Michael Hoffman as Sancho Panza. The play has been translated into Japanese, Swedish, Spanish and many other languages, and was made into a movie with Sophia Loren, as Aldonza, and Peter O’Toole as Don Quixote. There have been two successful Broadway revivals in 1977 and 2002. Known to Connecticut audiences, Thiesfield is both an actress and singer whose career has taken her to perform many different types of roles, from an innocent to a prima-donna. Her experience in productions in many of the best known national stages, has taken her from Lincoln Center in NYC, to being cast in TV and movie roles, as well as appearing in the popular TV show Jimmy Kimmel Live. 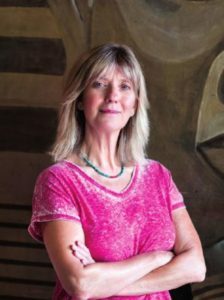 Her work has been recognized by the L.A. Times and other papers. Having graduated from UCONN School of Fine Arts, she continued her studies in California where she obtained her MFA. Having interviewed a number of Latino actors who are preparing for a roles in upcoming productions in Connecticut’s stages, I know how busy their schedules are. But, in spite of a busy rehearsal schedule, they are always willing to take the time to allow me to introduce them to our readers. Talia was very gracious and generous with her time in granting us a previous interview when she was performing in the play LMNOP, at the Norma Terris in Chester, CT, and again, now that she has returned to the stage at Ivoryton, allowing us to admire once again, her great talent. One of my favorite writers the novelist, essayist, and poet Jaime Manrique (author of Our Lives Are the Rivers) spent years researching Cervantes’ life. In his book Cervantes’ Street Manrique reimagines the already larger than life true story of Miguel de Cervantes, who flees Madrid after a near-fatal duel, loses use of his left hand in battle, (becoming “El manco de Lepanto); is kidnapped and sold into slavery by pirates, who believe he “will fetch a good ransom because he’s a war hero” and, finally, pens the masterwork Don Quixote. It is a fun and fast-paced book which might be of interest to those attending Man of La Mancha or those who simply want to get hold of a very good book. BR–Where are your parents from? Did they speak Spanish at home? TT: My parents are both first-generation Caribbean New Yorkers. My father’s side is from the island of Haiti and my mother’s side is Puerto Rican. Though Spanish wasn’t spoken regularly in my home, my grandparents and other family members would often speak in Spanish, so I can understand fluently. As far as speaking goes…well…I’m much more fluent in Spanglish. BR-Where did you grow up? BR- Do you identify yourself as Latina/Hispanic? BR-When did you become interested in the theater? TT: I come from an artistic family. My father is a photographer, and both my parents made sure to expose me to a great deal of music, art, and theater as a child. I remember attending the Hartford Ballet and seeing exhibits at The Wadsworth Atheneum at an early age. Also, every Sunday my parents would play either jazz or classical music. My father had box sets of all the classic composers — Bach, Beethoven, Chopin, Tchaikovsky… So it was only natural that I had a love of the arts early on. My interest in theater specifically began when I was about 10 years old and watched Audrey Hepburn in the movie version of My Fair Lady. I was singing and doing the accent for weeks, driving my mother nuts. She eventually enrolled me in a theater camp. BR-First play? Which are the memories you have of that experience? TT: Aye, this is one of my mom’s favorite stories! I went to a theater camp at The University of Hartford when I was 10 years old and we did a production of The Wiz. I desperately wanted to play the part of the lion. I wanted to paint my face, and wear the costume, and roar and growl at everyone. I always liked being a character. So, I auditioned (I sang a ballad by Vanessa Williams with my Walkman in hand). When they announced the roles the next day, I learned I had been cast as Dorothy…the lead. I was so devastated! I went home and cried for hours. Well, after the first day of rehearsals, let’s just say I got used to being the star pretty quickly. Haha! I continued performing with that same group for about five years and I credit the program director, Tobi Silver, with being the first to encourage my interest and skill for what would be my future career. BR-There is a myth about Don Quijote, and Cervantes’ life, how do you feel being part of the cast of this popular play? Have you done it before? TT: I’ve never done the show before and was actually not very familiar with it prior to the audition. In preparation, I watched the archival recording of the 2002 Broadway revival and I was transfixed. This show is so magical and it is truly an honor to play Aldonza. Iconic roles like Aldonza, Evita, and Fantine are special to us because they represent the strength and perseverance inherent in all women. They tell stories of women who endure and thrive through harrowing struggles and find dignity in their brokenness. As for Quixote, to me he represents the dreamer in us all. He’s the fearlessness and imagination we all had at one point before the outside world conditioned us to believe in practicality. He’s that corner of our subconscious that we wish we were brave enough to release once we’ve gotten older and more “responsible” and for that reason, this story is an important reminder to never lose sight of your dreams and to pursue whatever gives you purpose…no matter how old you are. BR-Do you have a favorite playwright or play? TT: I am a bit of a Shakespeare buff. I think I read my first Shakespeare play at the age of eight. I also love the plays Seven Guitars by August Wilson and By The Way Meet Vera Stark by Lynn Nottage. I enjoy slice-of-life plays…shows that give you a peek inside someone else’s world. The musical In The Heights also holds a special place in my heart. Not only is it a heartfelt peek inside the life of Latinos living in New York City, but the whole show really has a heartbeat like a conga! I mean, the sabor just really gets into your system. No matter who you are or where you’re from, you fall in love with the characters, their culture, their pride and tenacity. BR-Since you were last in Connecticut in LMNOP….what other roles have you played? TT: It’s been busy, and I’m so grateful! I’ve been honored to work on some of my favorite TV shows, including Veep (HBO), Limitless (CBS) and The Following (FOX). I also originated the role of Penelope Square in the new hit musical Polkadots: The Cool Kids Musical. The show is based on The Little Rock Nine and is a colorful history lesson for children that reminds them that our differences make us awesome, not outcasts. Additionally, I’ve been working with Glamour Magazine‘s online video department creating comedy videos for their website and other online venues. BR-Aside from the theater have you also worked in movies and TV? Do you prefer one type of acting to the other? TT: I’ve done film, TV, voice-overs, theater, and live concert performances, and each one has both benefits and disadvantages. On the one hand, I am very inspired and energized by the fast-paced nature of working in television. It forces me to make bold, specific decisions in my work and attack the material head-on. However, it can sometimes lack the personal connections we make during the rehearsal process and run of a show in the theater. In having more time, we build bonds with people that often develop into friendships long after the final curtain. BR-You have participated in plays in different places in the USA, do you have a favorite theater where you have performed? TT: It’s been such a joy to return to Connecticut, both while previously working at The Goodspeed and here now with Ivoryton. The serenity one finds in the Essex area makes for a wonderful creative process. Generally, I find myself feeling the most creative in locations by the water or in rural areas like Connecticut or The Berkshires. TT: I’m currently commuting back and forth to New York City a few times a week to rehearse for the upcoming NBC Diversity showcase…while doing Man Of La Mancha! The showcase, which will be at the end of September, will be a presentation for various network executives, producers, writers, and top industry players. It highlights the talents of a select few actors who are part of underrepresented groups in television: people of color, women, and LGBTQ actors. I’ll also be celebrating the release of the World Premiere recording of Polkadots: The Cool Kids Musical, for which I originated the role of Penelope Square. The album will be released through Sony Masterworks and will be available on iTunes! BR-What do you do for fun? TT: In my time off, you’ll usually find me at the gym or running, if the weather permits, during the day. In the evenings, I’m often trying new food somewhere or meeting up with friends at my local haunt for some jazz and a glass of wine. I love to read, and actually can’t wait to go visit RJ Julia Bookshop soon! I’m also a TV junkie so I enjoy binge watching my favorite shows online. BR-Thanks for taking the time to answer our questions and wishing you continued success. TT: Thank you! It was a pleasure!